Print on cardstock and laminate. Make 1 gameboard for every 2-4 students. You will need 1 die for each gameboard. 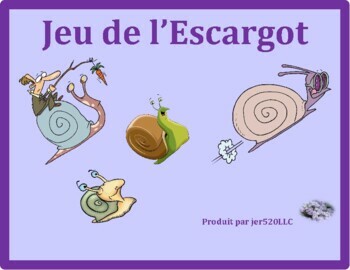 Students take turns moving along the the snail path and conjugating verbs along the way. Games include a mixture of all verbs - regular ER, IR, RE, spelling change verbs, reflexive verbs, Vandertramp verbs, irregular verbs. 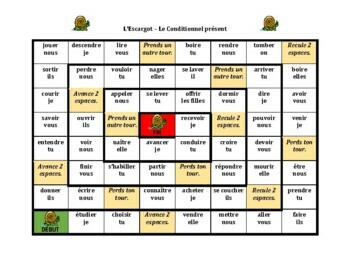 The exact same gameboard is included 4 times, with only the title being different: conditionnel passé, conditionnel présent, plus-que-parfait, imparfait. The price is the same as a single board product.